Public understanding of environmental issues—from global warming to water pollution to the loss of biodiversity—is more important than ever as American citizens, the business community, educational institutions, and government work together to forge a sustainable future through environment-friendly practices and policies. Founded in 2014, The Yale AP-NORC Environment Poll—a collaboration between the Yale School of Forestry & Environmental Studies and the Associated Press-NORC Center for Public Affairs Research—employs best-practice survey methods to provide the public and policymakers with a nationally-representative, comprehensive, and objective picture of American environmental beliefs and behavior. It is the world’s most widely-disseminated survey on the topic, reaching upwards of a billion people a year. 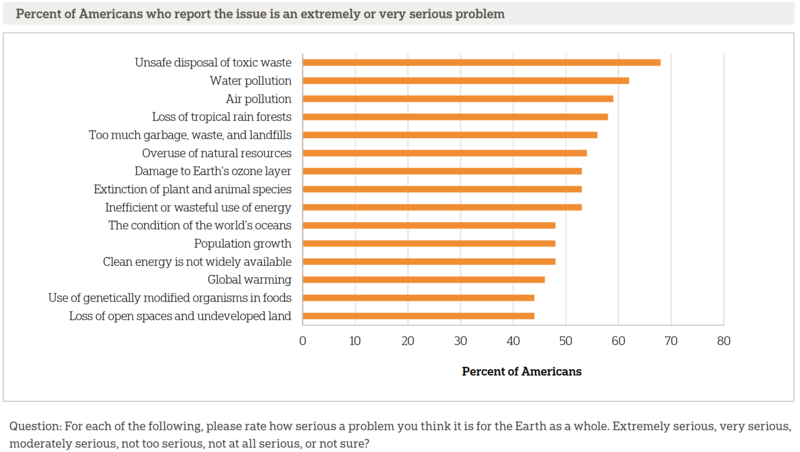 Over half of Americans think global warming is happening, one in five do not, and about a quarter are unsure. About twice as many Americans favor U.S. participation in international climate negotiations as oppose it. A majority of Americans say environmental protection will improve economic growth and provide new jobs in the long run. A segmentation analysis of the poll data identified nine segments of the American public based on a diverse set of attitudinal measures, such as the importance individuals place on environmental protection, what the government’s role should be in regulating it, whether an environmental crisis exists, how individuals see themselves in relation to nature, and how individuals respond when scientific and religious explanations conflict. The segments range from the “Liberal Greens” on the environmentally friendly side to the “Conservative Browns” on the more anti-environmentalism side. But the data show that the majority of Americans, 65 percent, fall somewhere in the middle, holding complex and nuanced perspectives on the environment. The AP-NORC Center was created to join the expertise of the National Opinion Research Center at the University of Chicago (NORC), one of the world’s premier independent research organizations, with the Asoociated Press (AP), which provides news seen every day over all media platforms and formats by more than half of the world’s population. This combination of rigorous, objective research and reliable, unbiased journalism has unmatched potential to reach both broad audiences and policy makers at every governmental level, creating a seamless transition from the gathering of survey-based information to a more fully-informed society.